Let’s face it. Sometimes people hurt us. We know we’re supposed to forgive them but it’s often really hard to actually do that. Especially when the people who hurt us are either family or other Christians. I wish I could tell you I have a simple little formula for this but I don’t think there is one. Sure, there are some steps you can take. But like so many things in our faith, there’s no little magic pill to make it all happy. Instead, forgiveness is a choice that often has to be walked over the course of years. There are so many practical reasons to walk in forgiveness. Things like releasing yourself from the pains of your past. There are health benefits (bet you didn’t know that). There’s the mental benefit of just letting it go. But this is much deeper. Jesus tells us we must. 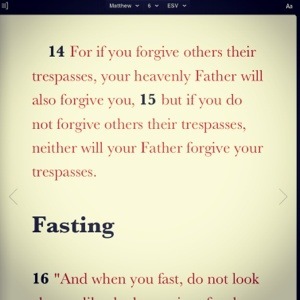 So what can I do to forgive? Forgiveness always starts with God, the creator of forgiveness. The giver of the greatest forgiveness of all. And that’s the secret right there. Hidden in plain sight. 1. Remember how much we’ve been forgiven. In Jesus’s parable about the unforgiving servant (Matthew 18:21-35), he talks about a servant who is forgiven much but then fails to extend mercy to another servant. Instead, he’s extremely harsh with his brother. Because of that, he is judged and sent to be tortured. Not a pretty picture. And why was he sent to be tortured? Because he failed to release his brother’s debt. He decided his brother didn’t deserve even the slightest mercy even though he’d already been forgiven so much. 2. Ask God for the gift of forgiveness. God is able to give you the ability to forgive. It is in his strength alone that you’ll have any hope of success. So ask. 3. Remember it may take time. We live in an instant society. Frankly, I don’t even like to wait 5 minutes for my baked potato to come out of the microwave (think about that for a minute – 5 minutes). But forgiveness is more like a crock pot meal. It’s the kind of thing that we may have to do more than once. Not just because people offend us more than once. But also because, while we might decide to forgive, we may also have difficulty putting it into practice. Even some of the people we might consider to be pillars in the faith have struggled with forgiveness. If you’re struggling with forgiveness, start working on it now. Start seeking God’s face. Start asking him for the gift of forgiveness. And keep at it.